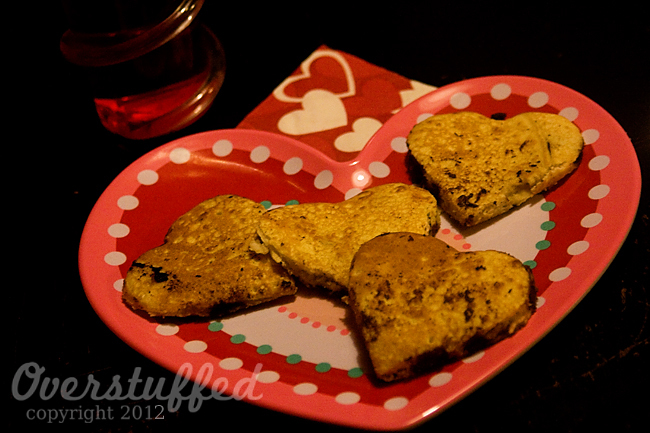 Our traditional Valentine's Day Breakfast 2012 consisted of heart-shaped, chocolate-chip pancakes. Joel was set on making pannu kakku, but we realized at 6:30 this morning that we don't have an oven! Delivery tomorrow, thank goodness. And pancakes did the trick just fine, anyway. People, Valentine's Day has plumb wore me out this year. I diligently had something for the girls in their mailboxes every. single. day. And it was a lot harder than I thought. I had prepared ahead quite a bit, but 14 days is a lot of days! And so I found myself frantically getting things together at the last minute sometimes, but it all worked out. Except, by today, I was kind of finished with Valentine's Day. The girls were not, of course. They loved it more this year than ever (and it's all my fault), so I suppose all of the stress was worth it. Next year I'll plan better. I'll have to, because I'm afraid I have set an insane precedent and made another holiday tradition. And the making of new traditions does not necessarily cancel out old ones. No way, no how. My children cling to tradition as if it were the rope thrown to them as they are drowning at sea. Especially Chloe. That child would wither and die if we didn't continue every tradition we have ever started. So there's no way in heck that she was going to let us forget our annual Valentine's breakfast! Or our books! So, even though Joel and I wanted nothing more than to sleep in and not make a big breakfast, we did it. And of course we're glad we did, don't get me wrong! Traditions are the stuff that keep families together, and we love it. The girls really loved their books this year. I did good, I guess! Bria got The Wizard of Rondo, which is the sequel to a book she recently read and talked about incessantly. I have never enjoyed the fantasy genre much, but she totally gets into it. Consequently, it has been hard for me to find books that I think she will like, beyond Harry Potter, which she has read several times. She was totally thrilled to get this book, and I'm pretty sure she'll be finished with it by tomorrow. Even though she's hiding behind it, Sophia was quite pleased with her new Silverlicious book. She's been wanting it for a long time. As for The Maestro and I? Well, tonight was rehearsal, and this week is the dreaded concert week. No big Valentine's Day celebration for us. I've spent the evening updating my Project 365... oh so very romantic. We'll go on a date next week I guess. Oh, way to go. I love that you made the kids a priority and kept your traditions. I've occasionally let traditions slide, and actually don't make a lot of traditions for non-Christmas holidays. I'd like to, and maybe I will one day. I love reading about yours. Has Bria read the Books of Bayern series? There are 4 and it starts with Goose Girl. I think they are wonderful books---not as fantasy as Harry Potter, but there are definitely elements in there. It's one of my favorite series. There's also Princess Academy from the same author.